The LG G4 is slightly bigger than its predecessor, which already was more a phablet than a phone. It's smaller than the iPhone 6 Plus and not much bigger than a Galaxy S6 though. The new phone is recognizable by its more rectangular design, while the G3 corners were rounder. The big change, however, is that the body is slightly bent. It's not flexible like the G Flex, and the curve really isn't that pronounced. It's just a subtle design element on the LG G4. The company claims the curve actually makes the new model 20% more durable than the G3 and "much tougher" than the likes of the Galaxy S6 and the iPhone 6. Part of that is that if the phone falls face down, the curve will keep the screen away from the floor. The back features the trademark design with centrally placed volume buttons, right below the camera. The basic back cover is made of plastic and comes in Metallic Gray and Ceramic White among other colors. The white one actually features ceramic paint. These covers have a 3D diamond pattern. The optional leather cover took three years of research to get it right. LG selected a vegetable tanned leather, a laborious process that takes three months, so only about 10% of all leather products are tanned this way. These covers feature decorative stitching down the center line with Gütermann thread. On these covers the G4 logo is embossed. The plastic cover feels good in the hand and masks fingerprints well, but the leather option evoke associations with the seats of a sports car or an expensive wallet. LG will offer a number of color options, but there aren't any plans for Moto Maker-style customization. 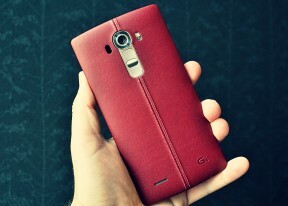 Still, the leather backed LG G4 feels like a premium feature. Plastic or leather, the back cover is removable, giving you access to the battery, SIM and microSD slots. The battery has 3,000mAh capacity, same as the LG G2 and G3. The new chipset allows the LG G4 to last 20% longer on with the same battery, says LG. While the capacity hasn't budged, we're more worried about the charging. The charger that comes in the retail box puts out only 1.8A, that's 9W of power. Most high-end Androids come with 10W chargers, while Quick Charge 2.0 devices go up to 15W. Wireless charging is available only with dedicated covers that support the feature. LG G3's unveiling caused jaws to drop - a massive 5.5" screen with extra-high resolution and on a reasonably priced phone too. This year LG kept those parameters the same, but improved the screen matrix with quantum dot technology. Quantum dots are used in a special kind of LCD, usually found in Sony's Triluminos displays (on TVs and Xperia phones). The promise is much improved color rendering - accurate without oversaturation. LG claims 98% coverage of the color spectrum, whereas the Galaxy S6 screen has 110%. LG tried to pass this off as oversaturation on Samsung's part but we shouldn't forget Samsung offers several Display modes to match the personal preference. The new display is 25% brighter and has 50% higher contrast according to official specs. The contrast was a weak point of the G3 screen so this is an important improvement.